You know those faucets in public restrooms that only stay on for a few seconds? 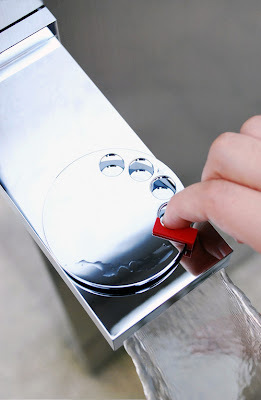 The ones before touchless sensors, where you press the button and get 5-10 seconds of water? Well, they're due for an improvement, and this time it ain't electronic. Designer Eun ji Byeon shows off a rotary-dial-style faucet at Yanko Design that fits the bill. You "dial" the wheel to the number of seconds that you want - and just like an old-timey phone, it winds back to its starting position and shuts off. Very nice: easily understood (at least for anyone who's ever used, or even heard of, a rotary phone), functional, and delightful. Well done!